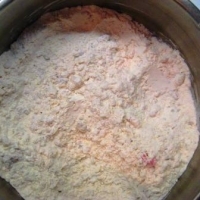 1/3 cup flour, possibly more when letting dough rise once your machine is finished making the dough. water mister or 3 ice cubes for helping to create a crusty and crunchy crust like you love on those Italian bastone loafs. 1/4 cup max of corn meal to place under dough when about to bake bread loaf. In large bowl, place measured flour in first. 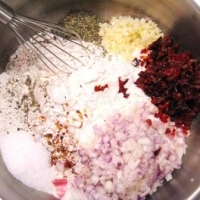 Then add all of the following: minced garlic, minced red onion, minced marinated sun-dried tomatoes, all herbs as noted, salt and pepper(s). 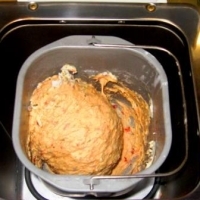 This will help from having to let your bread machine from doing all the work which may result in non-desired results with having clumps of an ingredient in only one spot in your loaf. Add yeast as necessary for your bread machine. Some machines want the yeast in first, others want it in last. 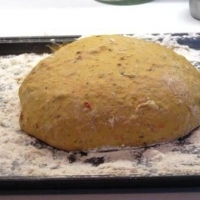 Put all dry ingredients with herbs and seasonings from bowl in order that your bread machine requires. Add remaining liquids: olive oil, butter, honey and warm water all at once per your bread machine. Turn that machine on and depending upon how long your machine takes, you will have amazing smelling homemade bread in your bread machine in no time flat. To make the rustic looking loaf like I did, I set the machine on the dough setting, which mine takes about 1-1/2 hours. 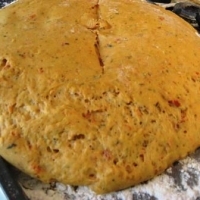 Once dough cycle is completed, put dough out onto floured surface and place clean dish towel over it. Let rest for 20 minutes before working it into the shape you want. Letting the dough rest will make it easier to work with. Is dough too sticky to work with? - See notes in "comments section" to correct this - you may have to add additional flour and work it in. Once rested, shape into a large baguette or round. 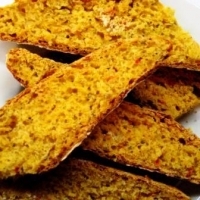 Place bread on cooking sheet that has been sprinkled with corn meal. 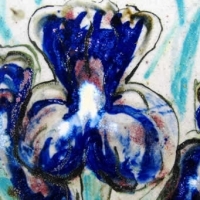 Cover with clean cloth, place in a warm spot (80 degrees F) and let rise until it doubles - anywhere from 20 minutes to 1.5 hours depending upon the room's temperature. Make a criss cross cut with knife if making a round shaped bread or several slashes along the bread if making a baguette shape. Using water mister, mist bread all over prior to putting in oven, turn down oven temperature to 350 and let bake for 30 minutes. No water mister? - Throw three ice cubes on bottom of oven when placing dough in oven to bake - this helps create a crunchy crust. Check after 30 minutes to see if done, "knock on bread", does it sound hollow? If not, bake for another 5 minutes. Take out of oven and let cool. Serve anyway you wish...with sun-dried tomato garlic butter, toasted with creme cheese or serve with hearty stew or soup or simply in any other way you like. 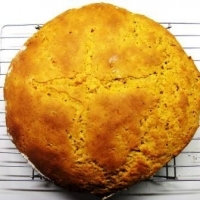 Enjoy this new bread recipe I created and I truly hope you have fun baking it! Tell me how you liked it, if you try it! Yikes on the instruction but I like sun dried tomato recipes and I am a baker. This is a must try in the future. YOu know when I first read your note I only saw the Breath deep and was think oh no holy $hi!!!(*&!%$! - thank my lucky bread crumbs it all came out just fine like it was supposed to! AMAZING, you have so many great posts I have had to subscribe to you so I don't miss anything. I can't wait to try this bread. It looks and sounds so wonderful and delicous. I adore bread baking! Thank you so much for sharing your recipe - and thanks for the additional notes. Great post! 1) This is a moist bread due to the water content in the onions and tomatoes, and in fact I had to add additional flour (more than I anticipated) and work it in once it came out of the bread machine since it was so sticky, then once the dough was looking right, I let it rest in a warm spot covered with a clean dish towel– I have adjusted the recipe’s water amount to correct this and you shouldn’t have any problems. By the way, this is a more than just a common issue when working with bread machines and adding wet ingredients like onions and the tomatoes, and I’ve noticed several cookbooks have mentioned this issue as well along with how to correct it. 2)I also made this bread in the dead of winter, so my kitchen is colder than I would have preferred not allowing the bread to rise as quickly as I would have liked. So to help push this and shorten the length of time, I heated the oven for only 3 minutes at 200 degrees (its lowest setting), I opened up the door, turned off the oven of course and then threw the dough in on a floured cookie sheet to rise covering the dough with a clean dish towel. Of course, take it out once it has risen completely (doubled in size) and then preheat the oven to 400 degrees. 3)Let baked bread cool completely for best results, though that’s a very hard task to do, but like meat when you take it out of the oven, you need to let the bread cool on down, this will ensure the best consistency inside which is slightly moist and help keep that crust crispy.